The Muslim Brotherhood are understandably angry after the killing of 638 people by the security forces of the military regime during the clearing of protest camps. However, as in Syria, the persecution of Christians is going largely unremarked. 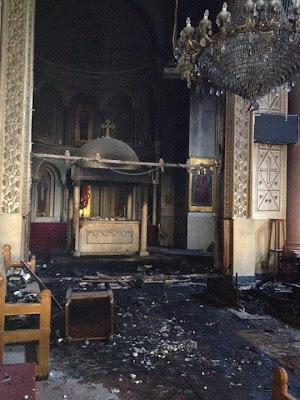 Having given praise where praise is due, to Paul Burnell's excellent reporting on the Dome of Home, I cannot avoid taking up an issue regarding the BBC and that is the extraordinary silence concerning the burning of Churches in Egypt. Nowadays if you want some unbiased coverage concerning the persecution of Christians, you have to go to Aljazeera. Deacon Nick Donnelly has a report from an Egyptian Christian listing Churches that have been attacked. Schools and orphanages have also been the target of violence. USA Today has an interactive map of various Christian institutions under attack. There is also a list with links to photos at The Blaze. There are also reports of some Muslims offering their Friday prayers outside Churches to protect them from being attacked. Let us pray for peace in Egypt and for our Christian brothers and sisters there.